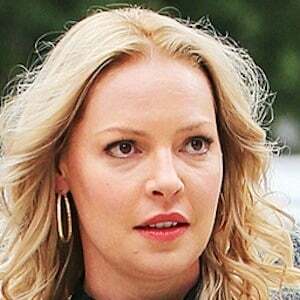 Actress who gained fame for her role as Dr. Izzie Stevens on Grey's Anatomy, which earned her a Primetime Emmy Award for Outstanding Supporting Actress in 2007. She also starred alongside Seth Rogan in the 2007 comedy Knocked Up. She returned to TV in 2017 as the star of CBS' Doubt. She appeared in a national TV commercial for Cheerios cereal as a child. She played lead roles in the films 27 Dresses, One for the Money and Life as We Know it and also had supporting roles in such films as The Ringer and Bride of Chucky. She was raised as a Mormon and married Josh Kelley in 2007. The couple adopted their first daughter, Nancy, also known as "Naleigh," in 2009 and a second daughter, Adalaide, in 2012. She gave birth to a son named Joshua Jr. in December 2016. She starred in the romantic comedy The Ugly Truth with Gerard Butler.